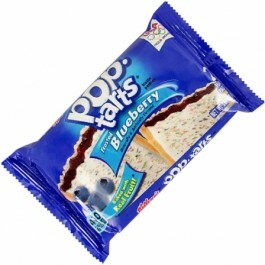 Kellogg's Pop-Tarts | Ontdek de Pop-Tarts smaken van USfoodz! Amerikaanse ontbijtkoek, gevuld met echte bosbessenjam en een frisse glazuurlaag. Enriched Wheat Flour (Niacinamide, Reduced Iron, Thiamine Mononitrate [Vitamin B1], Riboflavin [Vitamin B2], Folic Acid), Corn Syrup, High Fructose Corn Syrup, Dextrose, Partially Hydrogenated Soybean Oil, Sugar, Crackermeal, Modified Wheat Starch, Salt, Modified Corn Starch, Dried Blueberries, Dried Apples, Dried Grapes, Leavening (Baking Soda, Sodium Acid Pyrophosphate, Monocalcium Phosphate, Calcium Sulfate), Citric Acid, Cornmeal, Gelatin, Caramel Color, Xanthan Gum, Soy Lecithin, Color Added, Red No.40, Niacinamide, Reduced Iron, Vitamin A Palmitate, Pyridoxine Hydrochloride (Vitamin B6), Blue No.1, Blue No.2, Riboflavin (Vitamin B2), Thiamin Hydrochloride, (Vitamin B1), Folic Acid, Turmeric.